We all have different reasons for wanting to return to college. This section is designed to help answer some of the questions you may have about returning to college as an adult. I have earned college credits in the past. Do I have to start over? I have a really busy life. How much time will I have to commit to earn my degree? I’ve been working in my field for 12 years. Can I get credit for what I’ve learned? Summer is a light time for me at work. Do I have to wait until September to begin? I like the idea of learning online, but I also like interacting with a professor and other students. Is it possible to have both? It’s hard to predict the demands of work and family life. What if I have to take a hiatus? There are so many demands on my financial resources. Can I afford to go back to college for my degree? Will completing my degree really help increase my earnings or get a promotion? How can I ensure a college or university is reputable and respected? Not necessarily. Many colleges and universities accept transfer credits from community or county colleges, or other accredited four-year degree programs. Learn more. It depends on the programs and degree requirements of the college or university you choose. Many schools require you to attend classes on campus several evenings a week or on weekends and then prepare for projects and tests outside class hours. Some schools offer more flexible options, geared to adult learners, such as distance learning or independent self-study, which lets you work at your own pace. And yet other schools offer a combination of both on-campus and distance learning. The length of time also varies according to the number of credits, if any, you are able to transfer to your new school. The more transfer credit you have, the less coursework you will have to complete. Learn more. That is a possibility. Thomas Edison State University and several other colleges allow you to take tests to demonstrate college-level knowledge or earn credits for college-level knowledge attained through employment experience, the military or other life experiences. You may even be able to earn credit for licenses and certificates you already may have or courses you may have taken at work. Learn more. Maybe. Along with a completed application, application fee, high school or college transcripts, many colleges require prospective students to submit scores from a standardized entrance examination, such as the SAT or ACT (undergraduate) or the GMAT or MAT (graduate). Schools that work primarily with adult learners may be a little more flexible in their admission requirements. Classes at most traditional colleges begin at the start of the spring, summer or fall semester. However, if you choose a college that offers online or distance learning, or other nontraditional programs, you may be able to start classes as soon as your enrollment is complete—no matter what time of year it is. Learn more. Yes, it is possible to have both—if you choose a school that offers both traditional and nontraditional degree programs or a school that caters specifically to adult learners. Certain schools give you the option of taking courses at a distance or attending classes on campus or at an accredited college or university of your choice, and then transferring credits back to your home school. Learn more. You might do well at a college that recognizes your commitment to family and career, and offers flexibility for motivated adult learners. If you need to take a break from coursework for personal or professional reasons, these schools let you resume your degree program at any time, without any loss of earned credits. 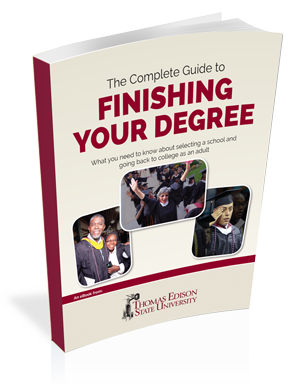 Finishing your degree is an important investment in your future, and the cost depends on how many credits your school and major require, and the fee per credit hour. Tuition and fees also vary whether you decide to attend classes on campus or complete your coursework through nontraditional means such as distance learning or guided self-study. You’ll also need to allow for the costs of books and school supplies. Many colleges will help you determine if you qualify for financial assistance and some will even guide you through the application process for grants, scholarships, student loans, and state and federal financial aid programs. You also may wish to ask your employer if you qualify for tuition reimbursement. Learn more. According to the U.S. Bureau of Labor Statistics, earnings are higher and the unemployment rate is lower for people who have high levels of education. The reverse is true for the less educated American worker. The national average for annual personal income of workers 25 and older with a bachelor’s degree is approximately $23,000 higher than Americans who only have a high school education. * Earning a college degree does not automatically mean you will command a higher salary or get a promotion; however, in both the private and public sectors, education does play a factor in certain bonuses and promotions. In some cases, a degree is required to ascend to the next level. The academic quality of any institution is directly tied to its accreditation, which is an independent review of a school’s educational programs to determine the education provided is of uniform and sound quality. An institution that has earned accreditation ensures that that it has met established standards of quality determined by the organization granting the accreditation. Accreditation determines a school’s eligibility for participation in federal and state financial aid programs, is important for the acceptance and transfer of college credit and is a prerequisite for many graduate programs. The most recognized and accepted type of accreditation in the United States is regional accreditation. Learn more.